I actually really like this product but I haven't tried any of their other items. What I did with it is thin the sauce out with some soy and add steamed broccoli. The soy sauce really cuts down the sweetness. Where can I buy these? 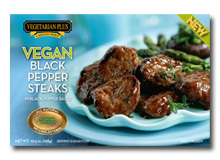 My Whole Foods used to carry the Vegan Pepper Steak but stopped. I loved it! Now I can't find it online or in any stores. Any suggestions?